When I’m working at my desk, or taking some ‘me’ time away from noisy kids and dogs, I’m usually wearing headphones so I can watch my favorite shows while I work, or listen to my favorite music. I have small ear openings, so ear-buds are a pain to use, or they’re always falling out, so I prefer headphones even when I’m connected to my phone to listen to music. I have a pretty sweet setup with a flat-panel TV hanging on the wall above my desk to watch whatever I want while working, and have the sound routed through my laptop so I can utilize headphones. I know, I’m a lucky girl. 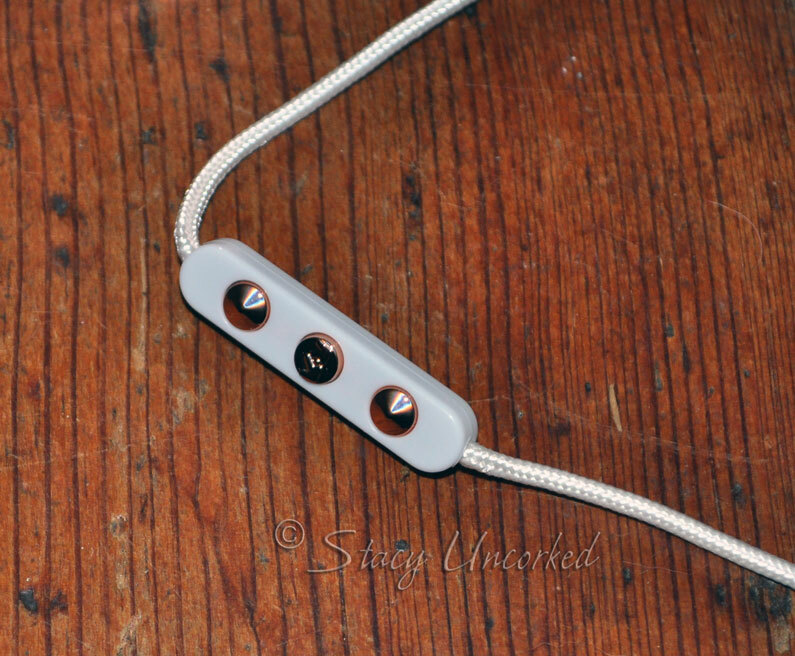 One thing I’ve noticed about headphones is that they’re kind of bulky, and I’ve already lost one of my favorite diamond earrings when the ear piece of my headphones snagged it and yanked it out – I’m sure it eventually got vacuumed up when I couldn’t locate it at all. In that case, I wasn’t so lucky. 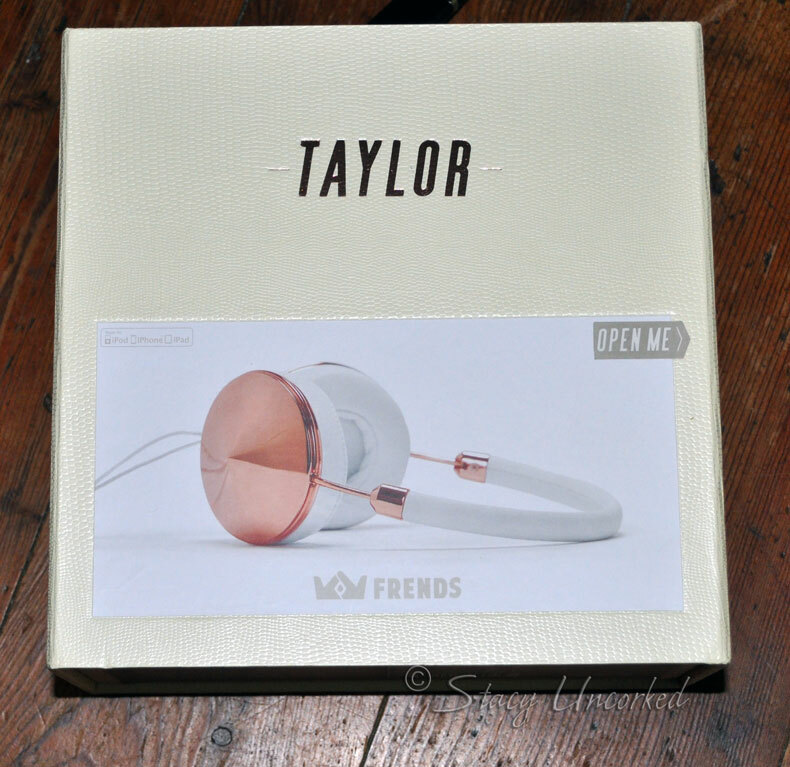 When I heard about Frends new Taylor headphones that are made specifically for women, I have to admit I was a bit skeptical about them, assuming it was just an advertising ploy to get us to buy specific headphones. Well I’m here to tell you us women really do need headphones designed just for us. 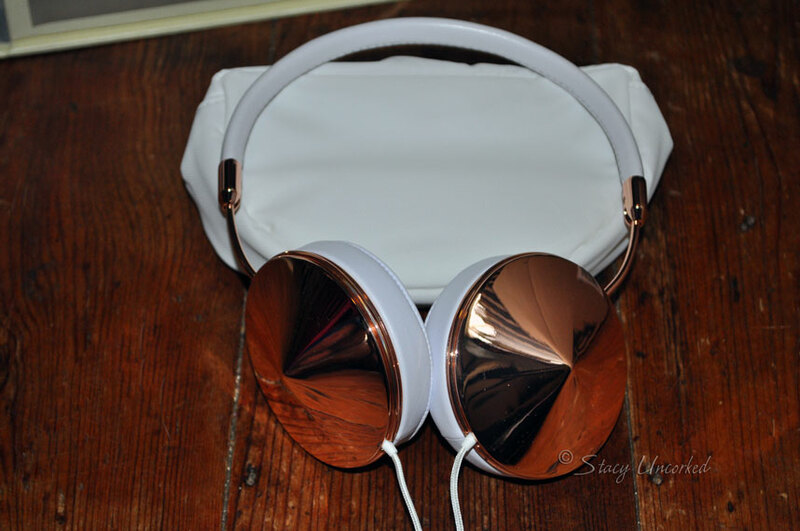 White leather with rose gold – aren’t those pretty? 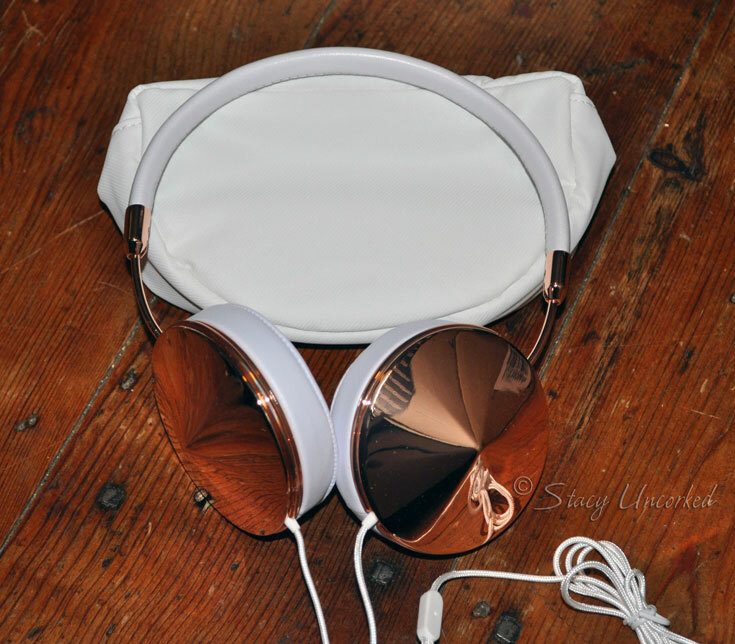 Not only do they have a cool ‘bling’ factor, but they actually fit so much more comfortably than boring bulky regular headphones. They’re lightweight, so I don’t get that pressure headache if I wear them too long like I do from other headphones, and they don’t cover my earlobes, so they haven’t had the nerve to yank out any of my earrings. The sound quality is phenomenal – they are not noise-canceling, but if I want to make sure I hear the kids, I prefer not to cancel the outside noise. They do muffle the outside sounds nicely, you know, in case you prefer not to hear the bickering. No matter what genre of music you listen to, you can crank it up and not worry about distortion or overpowering bass. Everything comes through crystal clear. Your newest statement piece. Turn the sidewalk into a catwalk with this over-ear headphone. 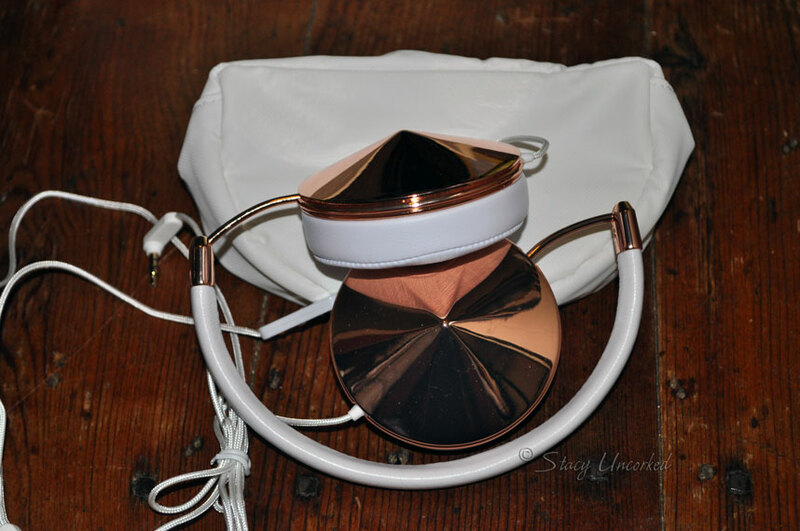 Soft leather in crisp white combined with rose gold metal hardware make it look just as good as it sounds. If you’re looking for stylish and high performing headphones, look no further. You can buy these headphones at Best Buy Mobile Stores – find one near you! Do you use headphones or ear-buds? 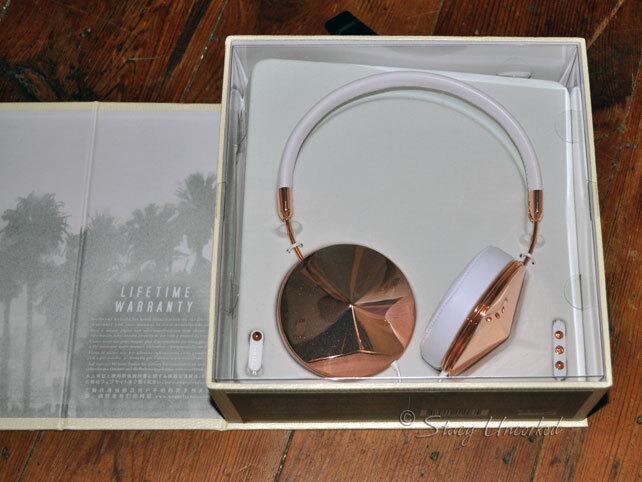 This entry was posted in Alert, Announcement, Review and tagged Alert, Announcement, Best Buy Mobile, bling, Frends, headphones, Review, rose gold, sound quality by StacyUncorked. Bookmark the permalink. Hi Honey, how’s it goin? Hope you’re taking breaks here and there so you won’t burn out! All is well here & by the way I’m having surgery on the 8th so I won’t be around either, but I have us covered. 🙂 Now dang girl look at these luscious earphones! I love them & they got style. Thanks for sharing, and you’re so right about the ear phones my ears are the same way! 🙂 Hugs all around!